Fall is approaching and what better way to get back into the groove of things then by coming out to our third networking social event of the year. Not enough motivation? The first beer or wine is on us. For the first time, BCAMA and BCIT Marketing Association (BCITMA) are co-hosting a networking social for BCAMA members, BCITMA members, BCIT students, alumni and our greater surrounding communities. This is a great opportunity (or excuse) to connect with old friends, make new ones & to build out your network. 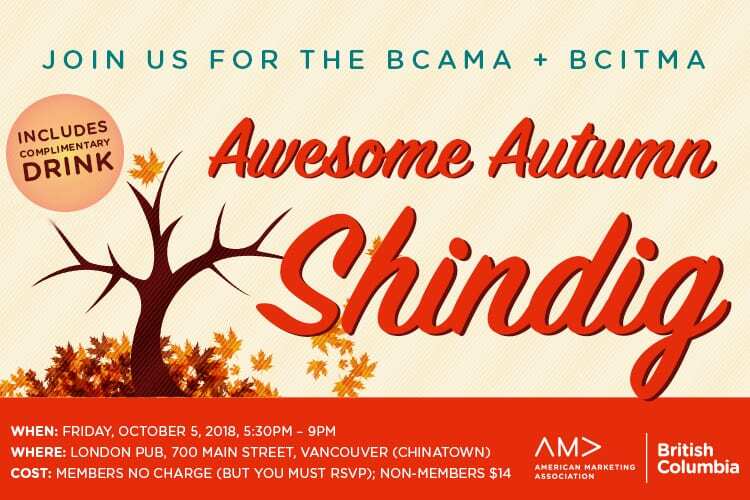 Be sure to join us, on the evening of Friday, October 5th for the BCAMA x BCITMA’s Fall Shindig. In addition to the complimentary beverage and appies, admission is free for all BCAMA members, BCITMA members, BCIT alumni and just $14 for everyone else. Space is limited, though, so be sure to RSVP and/or register as soon as you can. And remember, marketers don’t leave marketers behind… so go on and text, tweet, or ping the rest of your industry crew.